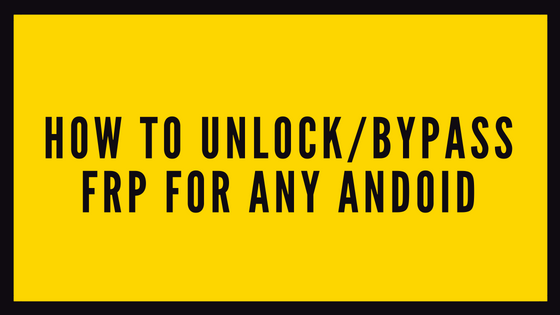 FRP Bypass APK This tutorial we will show you how to bypass FRP apk for and android device running android Lollipop, Marshmallow or Nougat. We're assuming that you run AOSP ROM or with minor tweaked custom ROM like In Focus In Life. To unlock FRP internet connection is required. We suggest you to use WiFi over mobile data. Computer or laptop is not needed so you can start the bypassing processing straightway with your mobile with INTERNET access. STEP 1] First make sure you have an internet connection to proceed with your mobile phone first run. STEP 2] As soon you boot your device, click on the Welcome or Next. Proceed till window asking for Google Account. STEP 3] As soon you hit this step, you may have attempt to enter any last email ID which synced with that device. If you got no luck with email id tap on text field and let the keyboard appears. From keyboard press and hold @ key. For different keyboard app there is a different way to reveal settings option. If @ is not available on default interface try with "," or whatever placed last column second left row. Swiftkey - Press and hold ","
STEP 4] For different keyboard accessing their settings also differs. → For GBoard - Long press "," key > Gboard keyboard settings > About > Terms & Services > Complete Action Using > Chrome. → For Xploree - Swipe from left to right. Help > EULA > Select text > Click on Assist/Search Icon or Search whatever appears on your screen. Complete action using > Google App. → For Swiftkey - Press and hold "," key which will open audio input. Tap on the globe icon next to it > Settings > Tap at the question mark at top - right which leads you to Help. Tap on Use "Ok Google" on Android, tap on three dots from top right > Send Feedback > Click on Terms of Services > Complete action using > Chrome. STEP 5] Now, if in step 4 you choose to go with Google app, open it and type Chrome in the address bar. Select chrome app once it shows. From google chrome search for "quick shortcut maker apk" or simply click on this link to download the working file. Remember not any other apk for this app works. File size - 2MB. STEP 6] Install the downloaded file. For the first time it ask for permission. Enable Unknown Resources from settings. Install the app and open it. STEP 8] Open Google app then chrome. Google for Google Account Manager and from APK Mirror site download the apk file. STEP 9] Install the google account manager if you found an error in step 7. Now open quick shortcut maker from Google App. Search for Google Account Manager and reach the fourth option. Tap on it > Try > From the type right corner, click on three vertical dots. It might not visible for some phone, but it will be placed on top right. STEP 10] Enter your email ID and restart. Now redo the first two steps. Later on your mobile will show you "Your first Google account is ready to use...." confirmation message. STEP 11] Once you have successfully unlocked frp goto Settings > Backup & Reset > Factory data reset and confirm it. It is not required but you can do it if you want to. This tutorial is the solution for "This device was reset. To continue sign in with a Google Account that was previously synced on this device". We hope you get every thing easily for few tips and trick please contact us.